I ran a 13.1/103.6 at HRP last Fri. Doesn't seem like much gain for the stuff I did. New CC Extreme Energy flat tappet hydraulic 268/280 cam, springs, rockers, and a new Air Gap dual plane manifold. That necessitated a lot of carb mods on my 625 Street Demon and going from a 2800 to a new 3000 stall TCI convertor. This whole deal ended up costing me $2500 and all I got was 2 tenths off my ET. Of course I still run street radials and a 3.25 gear. Seems like the more I lower the ET, the harder and more expensive it gets. I guess thats always gonna be true, LOL. Last edited by Rev; 01-08-2006 at 05:41 PM..
Getting closer to the 12's and still on street tires. Try more carb I picked up .15 going from a 750 to an 850 on my 428. 625 seems kinda small for a cam with that much duration. For being on street tires and only trapping 103 that's a pretty respectable ET. I trapped 116 on my street tires and only ran 1/2 second faster. Thanks for the replies. I still think I 'm going to try for 12's even on street tires. Traction for me doesn't seem to be too much of a limitation at least at the track with the VHT and the rubber laid down at the starting line. On the street, traction is an issue for my current setup. Whats your full mod list? How much does your car weight? What heads do you have? You really need to change gears you could probably drop three tenths pretty easily with a better gear. I think you have pleanty of carb for your displacement unless you are reving to the moon. Hit the link in my sig for a complete rundown on my car in user's rides. I really don't want lower than the 3.25 gears that I have since I run a C-4 with no overdrive. I like to cruise at 70 mph at 3000. I do run it up to only 6000 when I shift when racing. Thanks for the suggestions. get rid of the dual plane manifold change gears to 4:11 you can still drive it on the street go to solid cam and 4500 stall and you need a victor j.r on it and a good set of heads. 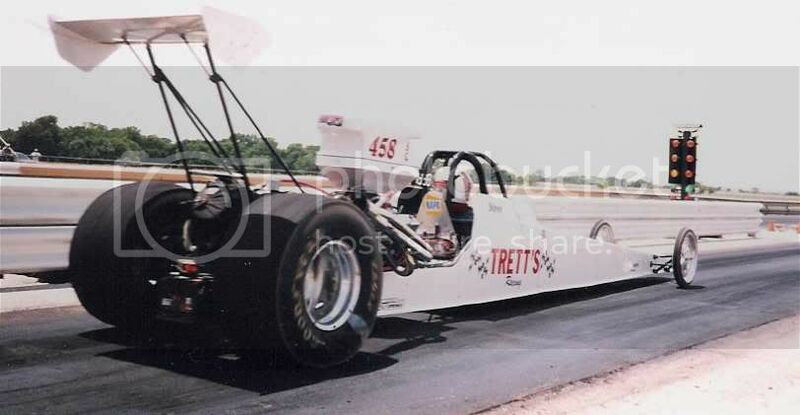 oh a dragster is not fun what you spend 20 grand and your in the 8's i mean that thing can only weigh 1800lb with motor.